Back to the original point of the post, has anybody actually called their OPC to confirm a price on this? Note "Part exchange (Send us your old part to receive the new one)" Maybe expensive to France. But your local OPC should be the same price? Possibly cheaper on the continent.....given your post on page 1. Note X on the end of part number denotes "remanufactured". New New engines are 99610095150 and 99610099655 are £16k - £17k. Time to flash that PCGB 10% parts discount card? That is my point, the original article said £3500+vat. Those prices are miles off that. I call bullsh!t on the original article. The OP said £3500. No mention of VAT. Has anyone actually got a copy of Total 911 page 10? I've emailed Exeter OPC as they usually give me a nice discount - will post the prices as soon as I hear back. I don't think anybody is doubting what is said in the article. I just doubt that it is correct. Nottingham OPC knew nothing of the reduction. Either it isn't true or it just hasn't trickled down to the OPCs yet. It would be nice to know the source of the information. FYI my car had its engine replaced by Porsche OPC in Aberdeen about 6-7 years ago. I'll have a look at the receipt for any item prices but if I remember right it was £10k all in. Not sure if it was short block though. It is an X code IIRC. do you have to get the old one back to Germany or just to the OPC....? Who wrote the article? Its there an email address for the editorial staff? Lets ask them. I want an X51 short block. Assuming you already have an X51 engine I think you will just need to swap the sump. 3.4 X51 had different pistons IIRC, 3.6 they were the standard ones. 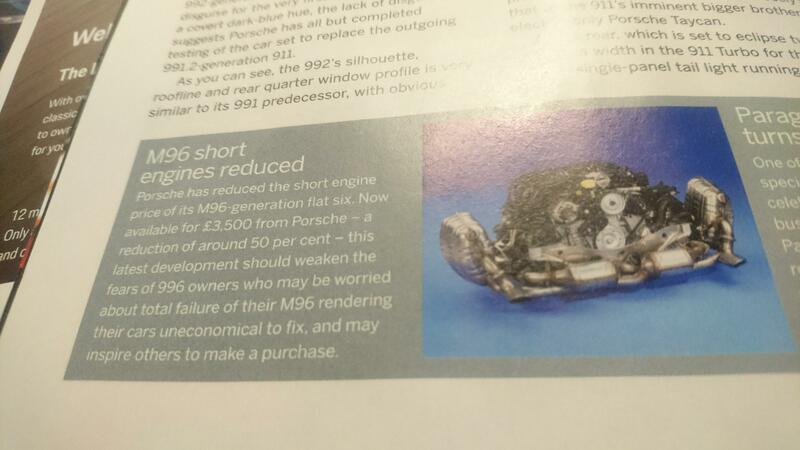 I'm sure there was a post on facebook from Goodwood where there was a Porsche engine display with the same pricing. can anyone with the mag share the email address of the editor to enquire? Hi Wasz, it was in Total 911. There is someone on pcgb forum that has actually bought one on exchange from Porsche. Doesn't say when he bought it. Cost £5k Inc vat and the exchange had to be clean .. I got price today £4600 + vat for a 3.4, guy said they been getting loads of calls since the magazine quoted the wrong price ! !